New York, NY – October 20, 2016 – Sigma Corporation of America, a leading DSLR lens, camera, flash and accessory manufacturer, announced today that the Cine High Speed Zoom 18-35mm T2 and 50-100mm T2 lenses will begin shipping on December 9, 2016 for a retail price of $3999.00 USD. Born from the new Sigma Cine family of products, the High Speed Zoom lenses leverage the outstanding optical design of the company’s world-renowned Global Vision still photography lenses. 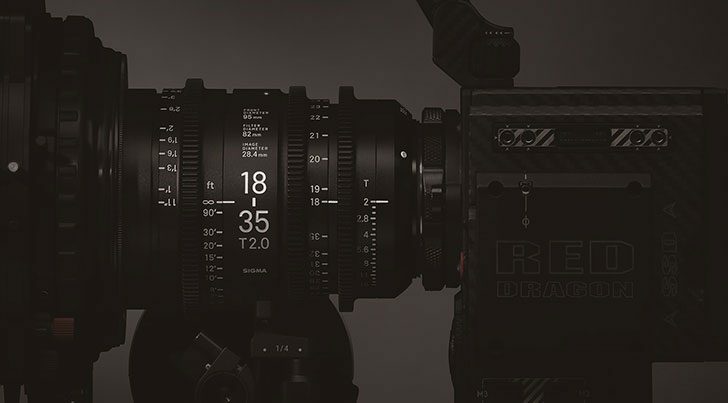 Combined with the 100% new mechanical lens body design, the Cine lenses meet needs of advanced 6k and 8k cinema production with the core optical quality DNA that has defined the Sigma benchmark of imaging excellence. The Cine High Speed Prime lineup features lenses ranging from 20mm to 85mm, with all five touting an aperture of T1.5. Highly compact and compatible with full-frame sensors, these lenses offer superior resolution. They bring a consistent level of light to the production, offering greater consistency to any film’s color, contrast and overall look before it enters post-production. The FF High Speed Prime line is designed for E, EF and PL camera system mounts. For more information on the Sigma Cine Lenses, please visit https://www.sigmaphoto.com/cinema-lenses/?link=Sept-M-cine.